It’s tough being the baby in a family with older siblings. Naptime never lasts long enough because of the noise. Hand-me-downs are a fact of life. And tiny little mitts get terribly cold during the inescapable winter school run. What’s a baby brother or baby sister to do? Get some fabulous Merino mittens from Uimi, that’s what! I’d certainly feel less guilty about dragging my own baby into the cold each day for school drop-offs and pick-ups if his hands were ensconced in a pair of these darling little Beci mittens. And happy day, they even come in sizes to fit his two-year-old sister! No more freezing cold mitts for my tots while traipsing after their big brother. Made from superfine and super soft Merino wool right here in Melbourne, the colour choices in the Beci are as delightful as the mittens themselves – poppy, apple, fairyfloss , daffodil, cloud and silver among them.The Beci mitten comes in two sizes – one to fit older babies and toddlers and the other to fit children aged between two and four. 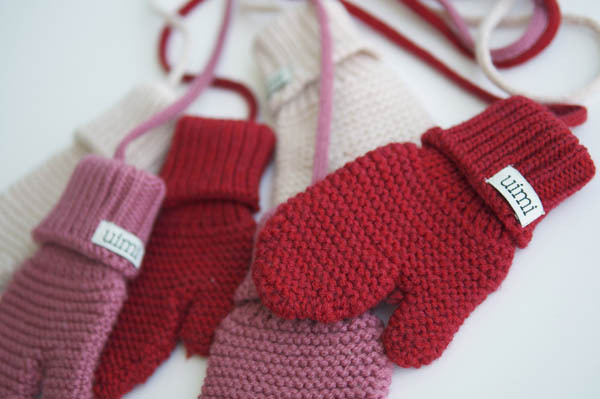 Uimi have added a clever string to keep the mittens together – just thread them through the sleeves of your child’s jacket and they can be taken on and off without getting lost. 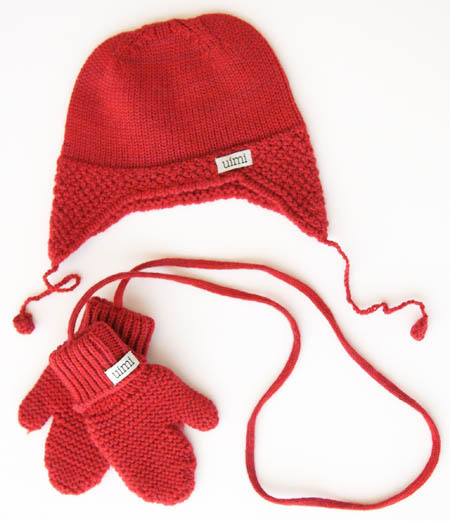 Uimi also has a range of lovely hats for babies and children to keep little heads as toasty warm as little hands. The Giles cap, a blend of Merino and organic cotton, comes in baby and kids’ sizes. The terribly sweet Mimi bonnet in pure Merino wool is just for bubs while kids can also choose the classic jersey Ike beanie in a Merino-organic cotton blend. Scarves along with wraps, mittens and booties for newborns are also available, with products priced from a very affordable $25. You can find a list of Uimi stockists, including the lovely Mulberry Tree Organic online store, here.